There are a variety of comment formats in PDF document, for example, note comment, text box comment, stamp comment, draw comment, etc. If you use the draw comment, you can choose ellipse, line, pencil, rectangle comment, etc. This article aims at showing you how to add ellipse comment for your PDF document. The application you need to use is the best tool for working with PDF document—VeryPDF PDF Editor. 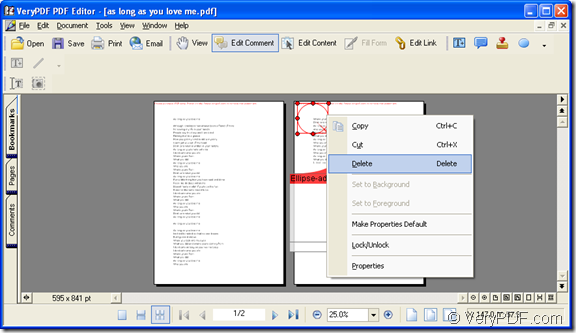 It can be used to edit the PDF documents such as the contents, comments, images or other elements. When you want to use PDF Editor, please download it at www.verypdf.com/pdf-editor/pdfeditor_setup.exe and install on your computer. You can click the following link to enter the homepage of PDF Editor for buying it if you want to use the application without no limitations: http://www.verypdf.com/app/pdf-editor/index.html. You can open the PDF document in PDF Editor via right clicking the PDF document and click “Open With”—“Choose Program” option in the dropdown list. Then please click “Browse” button to choose PDF Editor as the opening tool in the popup “Open With” window to open the PDF document. You can also click “Start”—“All Programs”—“VeryPDF PDF Editor v2.6”—“VeryPDF PDF Editor” to open the application and click “File”—“Open” to open the dialog box “Open” in which you can choose the PDF document that you want to edit. 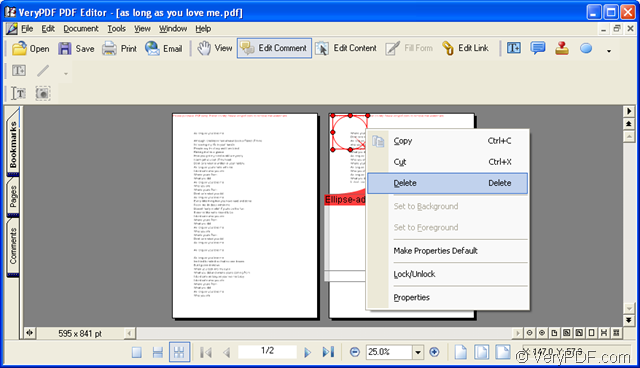 Then you will see the inputted PDF document in the interface of PDF Editor. Please click “Edit Comment” to open comment status or click “Tools”—“Edit Comment” to achieve the same purpose. Please click “Tools”—“Comment”—“Draw”—“Ellipse” or click “Add Ellipse” button in comment toolbar and click the left button of your mouse and drag it to any place until you can see an ellipse on the document pane of PDF Editor. Then you can loose the left button. Please see it in Figure 1. You can drag the ellipse to any place as you like and you can change its size via dragging the red frame which will appear when you click the ellipse. Double click the ellipse you can add the ellipse comment words in the popup commenting window. When you right click the ellipse, you can also edit it. When you finish editing the ellipse comment, please click “Save” button in the toolbar or click “File”—“Save” to save all the changes you have made and you need to create a new PDF document. Please click “File”—“Save as” to open “Save as” dialog box in which you can input the name and specify the location for the target file. Then all the operations come to the end and you will get a new PDF document with ellipse comment. This entry was posted in PDF Editor and tagged ellipse comment. Bookmark the permalink.